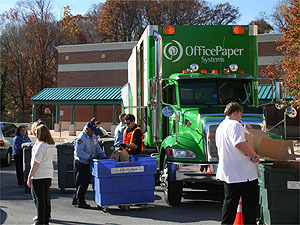 Bethesda Green volunteers help unload documents for shredding at Nov. 15 recycling event. On a spectacularly sunny fall day, Bethesda Green celebrated America Recycles Day Sunday, Nov. 15, helping Montgomery County shred and recycle paper at the Walt Whitman H.S. parking lot. A small army of volunteers assisted in directing traffic, distributing information and Honest Tea, and unloading boxes of paper documents and donated items. Let me echo Alan’s thanks to all of the volunteers who helped make the event a success. Last week Bethesda Green hosted a panel discussion about why it’s important to know where your food originates, featuring panelists Woody Woodroof of Red Wiggler Farm, Tony Cohen of Button Farm, and Marney Bruce from Grow It, Eat It. Each presented a different angle on that theme, from a historical perspective to how to grow your own food. The conversation then turned to small farms in Montgomery County, which have declined in numbers in recent decades. For Rana Koll-Mandel, co-leader of Bethesda Green’s Sustainable Food & Agriculture team, the discussion reinforced what she’s learned during the past year. “Local food and the support of local agriculture is really important because the issue is not demand. There are so many people who want to support their local economy. The problem is supply – we don’t have enough farmers,” she said. To bring back some small farmers and produce more local food, Woodroof is working with the county’s Green Economy Task Force to explore creating a small-farm incubator in Montgomery. The idea is based on a successful small-farm incubator in Vermont. The evening panel discussion at Bethesda Green drew a crowd of 25 or so people and sparked a vibrant discussion and plans for further collaboration. Want to be a part of the local and sustainable food scene? Come to our next food talk November 17; check our Web site for upcoming events; join our Facebook fan page; or drop us an e-mail and we’ll put you in touch with the Sustainable Food & Ag team.